This vector is based on the commercially available vector pYES 2 by Invitrogen. Furthermore we designed several vectors containing our constitutive promoters Tef1, Tef2 and ADH and different additional terminators. The different versions of the vector have been successfully applied and tested in all other subprojects. The project work began with the replacement of the original multiple cloning side for a completely new designed multiple cloning site containing the typical RFC10/25 pre- and suffixes. Furthermore we integrated a gene sequence coding for a Strep-tag II in front of the suffix. This facilitates the purification and detection via Western Blot of expressed enzymes dramatically. The new multiple cloning side was constructed of four desoxyribooligonucleotides via oligonucleotide hybridization and ligation into the original pYES vector restricted with the outermost restriction enzymes of the old MCS. In a further step all forbidden restriction sides of the enzymes used in the RFC10/25 standard in the vector backbone were deleted via side directed mutagenesis. The picture above shows different vector samples of this successive process which have been restricted with NgoMIV, PstI and SpeI: The resulting fragments decrease with each step leading to the pure vector backbone which is linearized by cutting in the multiple cloning side. Hence our first expression vector containing the original galactose inducible pGal 1 promoter was ready for cloning with iGEM standards! A second step of this subproject was the exclusion of the f1 origin of replication for the phage λ and of the pGAL1 promoter. 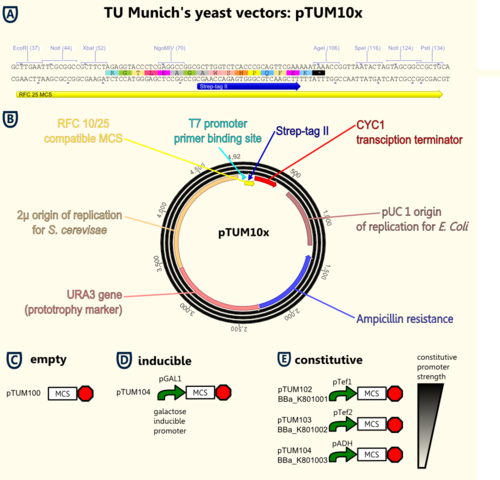 The resulting vector pTUM100 can used as powerful basis to integrate a wide variety of user defined promoters, genes and terminators. In our case we integrated the constitutive promoters Tef1, Tef2 and ADH in order to characterize them. Explanations on the figure: Figure A shows the new multiple cloning site (MCS) containing the RFC 10/25 restriction sides and the DNA sequence coding for the Strep-tag II. Explanations on the figure: Figure A shows the new multiple cloning site (MCS) containing the RFC 10/25 restriction sides and the DNA sequence coding for the Strep-tag II. Figure B gives an overview of all important functional elements located on the vector backbone. Upstream to the new MCS lies a T7 promoter primer binding site allowing easy forward sequencing of integrated gene constructs using the standard T7 primer. The URA 3 gene is a prototrophy marker used for the selection of transfected cells. Figure C to E present the successfully designed BioBricks: * pTUM100 simply contains the new MCS, the transcription terminator and further elements required for cloning and transfection. * pTUM102 to pTUM104 contain in addition the constitutive promoters pTef1, pTef2 and ADH. * pTUM104 keeps the galactose inducible promoter pGAL1. The T7 promoter primer binding site allows easy forward sequencing of integrated gene constructs using the standard T7 primer. The new RFC 10/25 compatible multiple cloning site enables straightforward cloning operations according to the iGEM standards. The CYC1 transcription terminator is an efficient and S. cerevisiae INVSc adjusted terminator of the transcription. The pUC origin permits high copy number replication in E.coli and therefore a simplified cloning. The URA3 gene renders possible to use the uracil prototrophy of the stem S. cerevisiae INVSc as a selection marker for transfection. pTUM100 simply contains the new MCS, the transcription terminator and further elements required for cloning and transfection. pTUM102 to pTUM104 contain in addition the constitutive promoters pTef1, pTef2 and ADH. pTUM104 keeps the galactose inducible promoter pGAL1. All of these versions were submitted as Biobricks. The pGAL1 promoter system is repressed in presence of glucose(West et al., 1984). Therefore maintaining cells in glucose containing medium causes the lowest basal transcription activity. Changing the carbon source to galactose de-represses the promoter so that transcription activity increases(Giniger et al., 1985). Alternatively cells can be maintained in raffinose which neither repress nor induce transcriptional activity. However the induction of transcriptional activity by galactose is accelerated by maintaining cells in raffinose. To characterize th pGAl1 promoter we cloned eGFP in a pTUM104 vector and transfected S. cerevisiae INVSc cells. A single colony of 2-3 mm diameter was used to inoculate a overnight culture in 15 ml SC-U medium containing glucose. 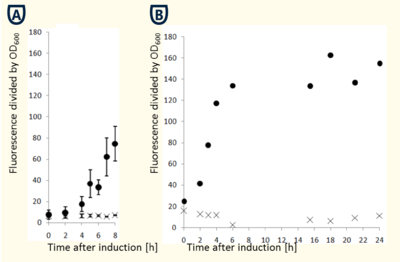 The OD at 600 nm was measured and an appropriate volume of cells was sedimented and resuspended in galactose containing SC-U media to create an initial OD of 0.4. In the further process samples of 1 ml volume were taken hourly and the OD at 600 nm as well as the fluorescence at 488 nm were determined. The fluorescence signal was normalized by divide by the OD600 signal. The figures above show that the cells need to 6-8 h to reach a stable level of promoter activity. However the obtained data may vary in dependence on the time which is necessary for a protein to fold itself correctly. The data shown above as well as the numerous successful expressions of desired enzymes based on the pGAL1 promoter did prove its functionality. Nevertheless we will characterize this as well as all of the constitutive promoters via luciferase assays to consider different protein folding times. Furthermore we will design an additional vector carrying a His-tag instead of a Strep-tag II in order to extend the application range. [West et al., 1984] West, R. W. J., Yocum, R. R., and Ptashne, M. (1984). Saccharomyces cerevisiae GAL1-GAL10 Divergent Promoter Region: Location and Function of the Upstream Activator Sequence UASG. Mol. Cell. Biol.4, 2467-2478. [Giniger et al., 1985] Giniger, E., Barnum, S. M., and Ptashne, M. (1985). Specific DNA Binding of GAL4, a Positive Regulatory Protein of Yeast. Cell 40, 767-774.